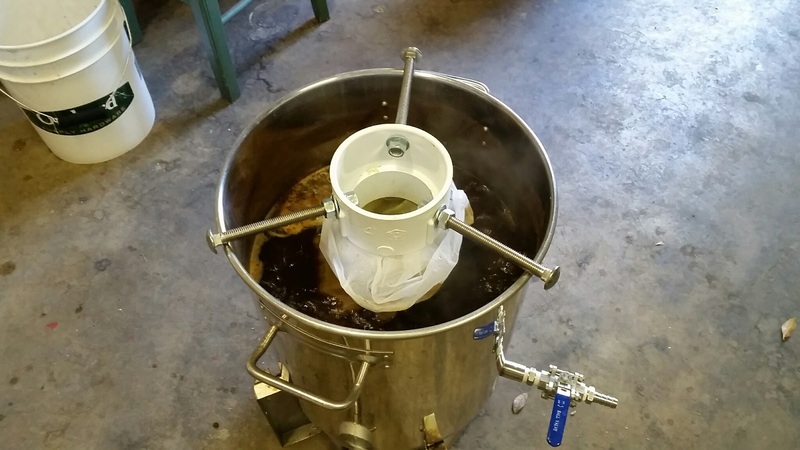 I’m always interested in expanding my skills and homemade brewing equipment, and it seemed like an opportune time to take a big step forward. I’ve been curious about washing and reusing yeast for some time, but just haven’t made the effort to enact the process. So, when I kegged my Seven Seas Session IPA, I saved the sludge from the bottom of the primary fermenter. 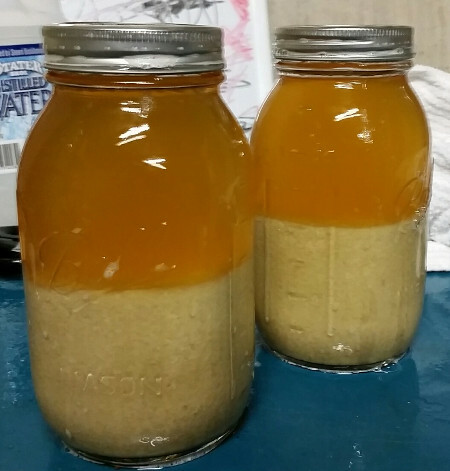 I added a bit of boiled and cooled water, and then decanted the slurry into two quart mason jars. Each jar was about 2/3 full (a little too full, in retrospect), and I then topped each up with more cooled and boiled water. I let them sit for awhile, and then decanted the liquid as well as the top layer of sludge into another quart jar. This, too, was topped up with water and then placed in the fridge for a week. Last night, in preparation for today’s batch, I prepared a 1L yeast starter and added the yeast from the bottom of the jar. This stirred overnight and into the afternoon, at which point I was ready to pitch the yeast. The starter looks and smells quite healthy, so I’m optimistic about this little experiment. Next time, I may instead overbuild a primary yeast culture and save that, instead of reusing yeast from a previous batch. I also decided to try adding the dark grains and crystal malts during the vorlauf, following a technique suggested by Gordon Strong in his recent homebrew recipes book. This was a little tricky when it came time to calculate the various water volumes required, and I missed the target by a little bit (I had done the calculations without the various crystal malts, and I also presume the oats soaked up a bit of extra water). I improvised by washing the grains at the end with a final pulse of water, and that brought me right to my volume and gravity target. Lesson learned! The final major addition to today’s brew process was the construction of a hop spider. I essentially followed directions from BYO magazine, but instead used a food-grade straining bag instead of a paint-straining bag. It worked quite well during the boil, and will definitely be easier than wrangling multiple bags during more hoppy brews. Today’s brew was an American(ish) porter, named in honor of a resident of our quarry this summer. It was also appropriately named as the dumping ground for a whole bunch of leftover ingredients and free samples, as well as my first attempt at yeast washing. I am under no illusions that some of the smaller grain additions will have a detectable effect, but I can’t stand the idea of throwing out those little packets, either! Given my experience with the last porter I brewed, which was a touch thin, I beefed up the recipe with a pound of flaked oats. I mashed in with 3.1 gallons of water at 168°, which stabilized to around 155°. The mash had dropped to 152° after 60 minutes. After 60 minutes, I added the dark and crystal grains, as well as 1.27 gallons of water at 185°. I let this sit for 15 minutes, vorlaufed, and collected 3.15 gallons of wort. Then, I added 3.65 gallons of water at 180°, which raised the mash bed to 164°. I let this sit, vorlaufed, and collected the remainder of the wort. This totaled 6.1 gallons at a gravity of 1.046. This was a little under my target on both counts, so I added 0.75 gallons of water at 120°. I drained this for the final collection. All told, I collected 6.75 gallons of wort with a gravity of 1.048. This works out to 75% efficiency. Once the wort came to a boil, I added the hops and boiled for 60 minutes. With 10 minutes to go, I added the Whirlfloc. At flame-out, I chilled the wort down to about 80 degrees and then transferred it to the carboy. I placed it in the fermentation chamber and cooled it for an hour or so, and then pitched the yeast. Starting gravity was 1.056, which should result in a final abv of around 5.1%. The unfermented wort has a nice dark color and a good taste. I plan to ferment this for 2 weeks at 68°. This entry was posted in equipment, porter, yeast and tagged Packrat Porter, PP. Bookmark the permalink. Thanks for the full and educational account! I learned a lot from reading this.